The resort is located in Punta Diamante, just five minutes away from Acapulco’s International Airport, and 20 minutes from the city’s bustling downtown. 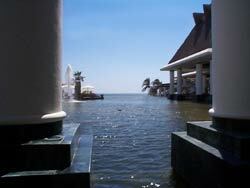 The hotel is located inside the Mayan Resorts, just across the exit of the “Autopista del Sol” highway. From Acapulco’s International Airport, take the highway going to Acapulco and drive for six miles, on the left side you will find the Mayan Resorts entrance. Follow the signs that will lead you to The Grand Mayan.